The simplest fall poses a massive danger to the elderly. That's why Sensoria and Orthotics Holdings Inc (OHI) have come together to bring out a new device, the Smart Moore Balance Brace, that helps its wearers avoid the disaster of a fall. The companies will be exhibiting the device this week at the Health 2.0 event, an event that showcases technology' role in healthcare. 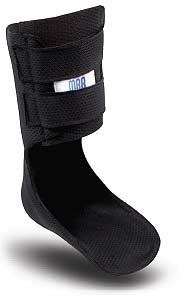 The Smart Moore Balance Brace is a refinement of the original Moore Balance Brace, a medical device that offers foot and ankle support that makes its wearer more stable while moving. That reduces the chances of a slip-and-fall incident, and makes it a welcome addition to many older folks' lives. But the Smart Moore Balance Brace takes things one step further by including connectivity, as well as the ability to measure levels of adherence, gait, and overall activity, giving doctors a better look at just how the wearer is moving and if there are any further issues to correct. A slate of sensors is built into the device, and a Bluetooth-enabled anklet connects the device to a mobile app as well as a Web-based dashboard system for easy access. The numbers speak volumes here: more than 30 percent of the over-65 population experience a fall each year. That's around 14 million people, and a lot of those falls may be preventable. While the device is just undergoing market studies right now, with an eye toward availability in 2016, there will likely be plenty of eager takers on hand. While some members of the over-65 crowd may not approve of such constant monitoring of day-to-day activities—not to mention the enhanced risk of information theft that comes with it—the idea that falls might be a thing of the past could be extremely compelling. Given that current studies show that the Smart Moore Balance Brace offers a direct benefit to balance and stability, the smart part might well be an easily-overlooked downside or even potentially considered a valuable additional benefit. The actual success of this device would likely come down to doctors' willingness to prescribe it and patients' willingness to wear it. If the two fields overlap in any substantial amount, then the Smart Moore Balance Brace could be one of the biggest new developments since the four-pronged walker, helping keep seniors upright and walking tall for some time to come.